In which the stick steps out of the mud and possibly goes a bit off the deep end. I originally referenced the Q&A about healing with the TF gun in the previous comic commentary, but I was jumping the TF gun a bit on that. 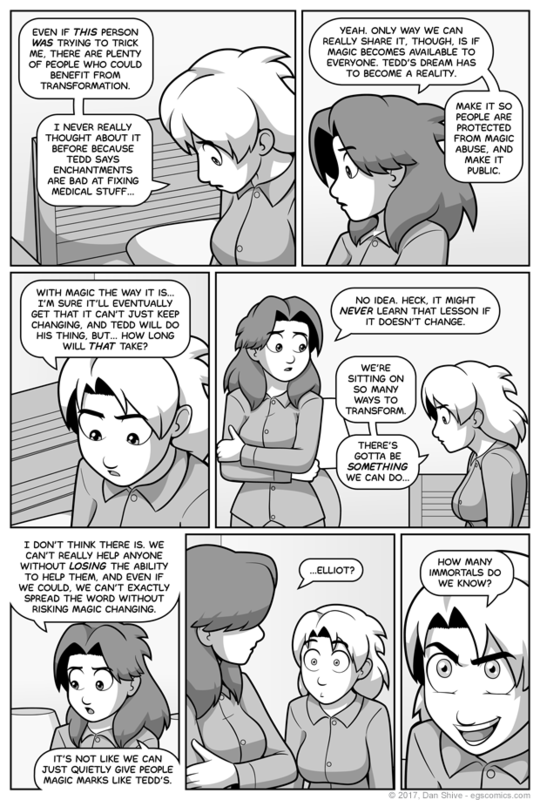 THIS is the comic that addresses that whole deal, which is a mixture of actual logic and not wanting magic to be an over-powerful cure all that would be truly, truly horrible not to share. The potential for immortal assistance was a relatively late realization on my part, but it fits suspiciously well with everything else I'd been planning and barely required any rewriting of the current story arc. Did some part of me know? Well, probably. My subconscious is smarter than me, and this was a logical thing to consider. It's more like finding a missing puzzle piece than cleverly thinking of something. If anyone asks, though, it's all very clever and handsome.